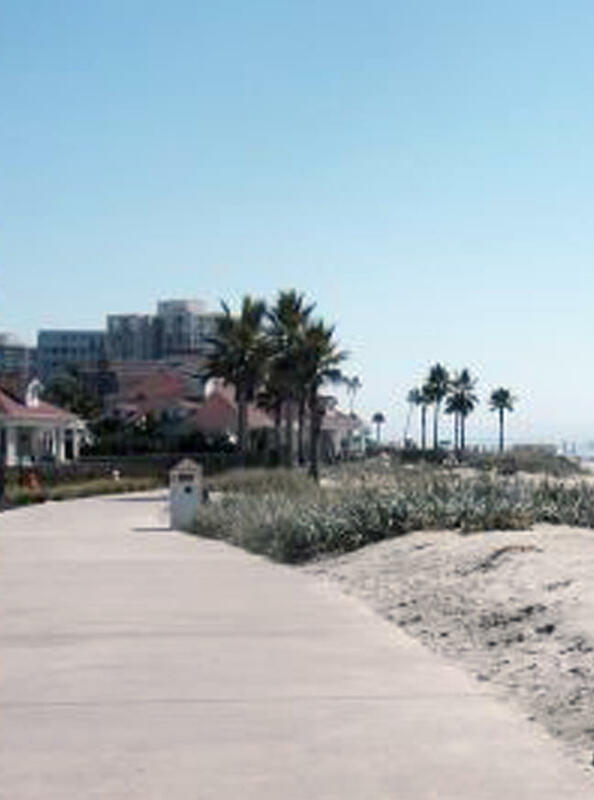 Coronado City Beach, on the ocean side of the Coronado Peninsula, is bordered to the north by North Island Naval Air Station and to the south by the U.S. Naval Amphibious Base. Trail/Pathway Details Promenade •Trailhead: Ocean Boulevard •Length: 1-2 total miles •Typical Width: 4 ft. & above •Typical Grade: Level •Terrain: Hard Accessibility: •Beach Wheelchair: Yes •2 motorized and 2 manual beach wheelchairs are available on a first-come, first-served basis. To check them out, ring the intercom on the Main Lifeguard Tower at 920 Ocean Blvd. for service. •Accessible Parking: Yes •Accessible street parking is along Ocean Boulevard at Isabella Avenue and Ocean Drive. Free lots for the beach by the Hotel Del Coronado are at •Avenida de las Arenas and one block south on an unnamed street. •Accessible Restroom: Yes •At foot of Isabella Avenue. Shower facilities include a roll-in shower with small, attached wooden bench and high shower head (no hand-held). •An accessible path extends at least 100 feet onto the sand from the sidewalk’s ramped entrance at Isabella Avenue.